The Nest Home Limuru – An appeal to all bloggers. Please take a look at this baby. Her name is Lucy. The story of how she came to nest home home is one that is not easy for anyone to read, but read we must. She was a few months old when she was raped. Defiled. Mangled. and think of what good we can all do to counter the evil that could befall her. 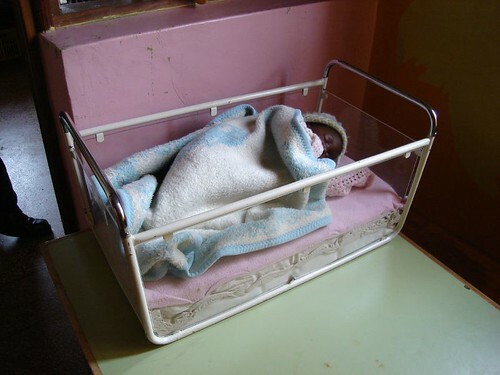 She is being cared for by the wonderful caretakers at The Nest Home in Limuru. Please keep her in your thoughts and if you have the means please donate to the Nest. Whenever you are in Kenya, please visit her and the other wonderful children at the Nest. As she grows, may she be able to dance and sing with the other children like this. We can counter the bad in our world, one person, one blog, one link at a time. Thank you kindly, on behalf of Afrigadget authors. This entry was posted in Africa, East Africa, Kenya by Juliana Rotich. Bookmark the permalink. moving story! all the best in her life! This is just too horrible – there is nothing more to say except to give our support. I think we need to do more to help the less fortunate members of the society. I felt guilty walking past crippled beggars in Tom Mboya street today, yet I could have done something to help the them ease their suffering. God willing, I hope one day I will make these people’s life more meaningful. How is little Lucy doing now that it’s a year later. Do you have a current picture. I lived in Nairobi and cared for a little one that also had been badly abused..